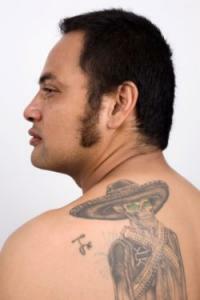 Tattoos are a great way to show off your heritage and culture - for example, Latino tattoos. These tattoos can demonstrate your feelings and love for your origins. The word Latino is derived from a Spanish word - latinoamericano and it is used to refer to Spanish and Portuguese speaking residents of Latin America. This includes residents of North America (from Mexico and Puerto Rico) as well as those from the Latin American and South American countries. Canadians who speak a "Latin" based language (French) are not usually included in the term Latino. Latino means a lot of different things to different cultures and individuals. Some people feel that the term is synonymous with Hispanic, although that is not exactly correct. Hispanic is a term that was brought into use by the United States Census Bureau in the year 1970, and it was supposed to refer to only residents/persons that had Spanish heritage by birth location, Spanish ancestry, or those who spoke Spanish in their households. Hispanic is not a term that is meant to cover residents of Latin American countries at this time, rather those who have moved to this country and have those Spanish roots. The culture of Latinos is a proud and vibrant one, with many different symbols and images being prevalent in Latino households, ranging from religious to very secular. Most Latinos in the US are very proud of their roots, and they can choose to show that pride with Latino tattoos. Day of the Dead tattoo. 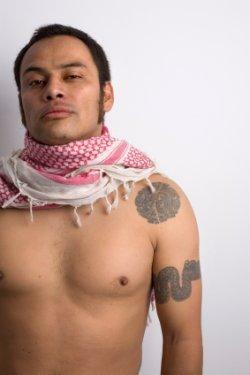 There are several different things that spring to mind when speaking of Latino images and tattoos. Most Latinos are Roman Catholic in their religious practices - and this adds a lot to the images seen in Latino households and in Latino tattoos. Images such as the virgin Mary, the sacred heart and Jesus are very popular among Catholic Latinos. These pictures can be seen as artwork on the walls of houses, or on bodies. Additional religious images include crosses, crucifixes and regional saints.Other images that are related to Latino culture have to do with the individual's country of origin. Mexican Latinos often identify with the ancient cultures that once ruled their land, so tattoos like those of Aztec symbols and gods are a popular choice. Other Mexican imagery can include skulls (symbolizing the Day of the Dead) and animals, as well as sun images which can be representative of both Aztec and Mexican cultures. Many who choose to get Latino tattoos will do so in areas of the country where there is a large concentration of Latinos. This means that it is usually quite easy to find a tattoo artist who is well versed in the cultural imagery of this group, as well as possibly even having flash art available to choose from. If you live in an area that does not have this concentration, your best bet may be to go to a larger city in your region, or to ask someone you know if they are familiar with tattoo artists who are versed in Latino culture. Additionally, if you plan to get anything inked in the Spanish language (and you are not a speaker) be sure your translation is correct. As with all cultural tattoos, it is important to make sure that you are not getting an incorrect symbol or image permanently inked on your body. Tattoo Johnnys has a large selection of art available, to get ideas before you head to the parlor. Vanishing Tattoos also has some flash for sale, in Aztec and Latino styles. While you may not wish to purchase flash for your piece, these sites can give you some great ideas on what you might like to have done.